Doctrine is not just teaching…it is specific teaching about absolute truth. 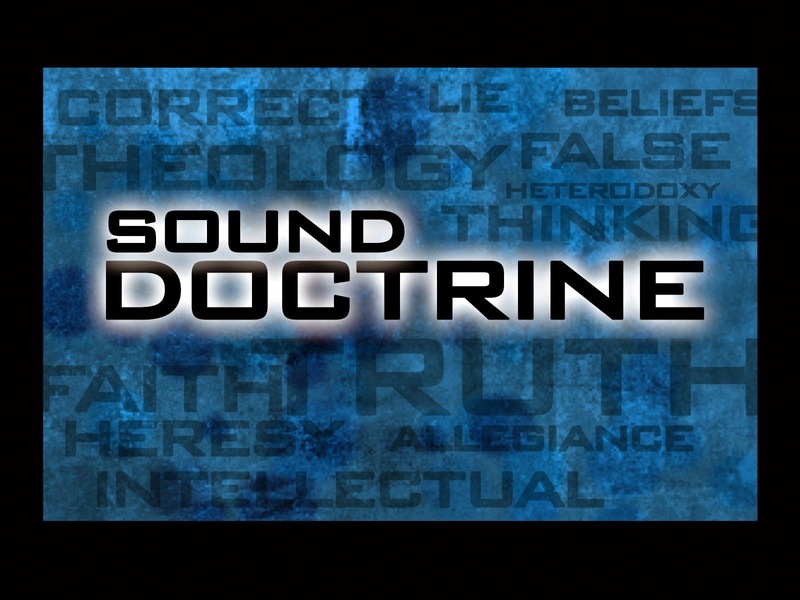 Noah Webster’s 1828 Dictionary defines doctrine: “That which is laid down as true by an instructor or master.” Scripture is the sole source of sound doctrine. When the Bible speaks of sound doctrine, it speaks of absolute truth as laid down by God in His word. Notice what heads the list of profitable things. Doctrine is the fundamental truth of God’s word, the indispensable component of spiritual growth…the catalyst of change. Our doctrinal beliefs are the basis of our convictions, and our convictions form our world view, which in turn should determine how we live our lives. Doctrine is learned progressively through a guided process involving instruction, faith, and obedience: “precept must be upon precept, precept upon precept; line upon line, line upon line; here a little, and there a little…” (Isaiah 28:10). As the Truth of God’s word is understood, assimilated and applied it gradually forms Christ-like character in, “those who by reason of use have their senses exercised to discern both good and evil” (Heb.5:14). The doctrine of salvation by grace through faith in Christ imparts eternal life. In the beginning, God spoke and instantly life began, and so it is with the second birth. When a person repents of their sin and accepts Jesus Christ as Lord and Saviour, the Spirit that raised Christ from the dead immediately indwells and quickens the new believer’s spirit. This causes a vital inner change, two spirits become one (1Cor. 6:17); a supernatural transformation from spiritual death to spiritual life occurs. Prior to salvation, the devil used the false doctrines of religion, philosophy, evolution etc. to deceive, keeping us blind to God’s truth. The second birth is a classic example of how the sound doctrine of God’s living word imparts life. “But God be thanked, that ye were the servants of sin, but ye have obeyed from the heart that form of doctrine which was delivered you” (Rom. 6:17). “That if thou shalt confess with thy mouth the Lord Jesus, and shalt believe in thine heart that God hath raised him from the dead, thou shalt be saved” (Rom. 10:9). “Being born again, not of corruptible seed, but of incorruptible, by the word of God, which liveth and abideth for ever” (1 Peter 1:23). There is a multitude of various religious teachings (doctrines) concerning the salvation of man, yet only one is true! “Neither is there salvation in any other: for there is none other name under heaven given among men, whereby we must be saved” (Acts 4:12). Jesus proclaimed “…I am the way, the truth, and the life: no man cometh unto the Father, but by me” (John 14:6). “Therefore if any man be in Christ, he is a new creature: old things are passed away; behold all things are become new” (2 Cor 5:17). Being born again is all about supernatural CHANGE: “new creature”, “new man”, “newness of life”, “newness of spirit.” It’s not about getting religion or converting to another denomination, turning over a new leaf, or vowing to be a better person: New life begins where there was none before. However, the wonderful miracle of the second birth is only the beginning of CHANGE; the starting point of a whole new life, “…he which hath begun a good work in you will perform it until the day of Jesus Christ” (Phil. 1:6). The purpose of Jesus’ death, burial and resurrection not only concern the salvation of soul but the transformation of life.“To reveal his Son in me…” (Gal.1:16). The cross not only secures eternal life but also enables the transformation of present life: “to be conformed to the image of his Son.” (Rom.8:29). The goal is to develop “Christ-like character”…a total change of HEART, OUTLOOK, and PRIORITIES “…by the renewing of your mind” (Rom.12:2). “The entrance of thy words giveth light…” (Ps. 119:130). This involves a process of yielding, by which we allow the truth of God’s word to reshape our thinking, restructure our priorities and refocus our outlook…so that our way of thinking, living and responding lines up with His. Many are the believers who seem to be ignorant of this foundational truth, failing to fully comprehend the purpose of salvation. It is obvious that contemporary Christianity has left off teaching the vital fundamental doctrines of the Bible: “co-crucifixion”[Gal.2:20], the distinction between the believers “standing and state”, the significance of “spiritual circumcision” [Col.2:11], the dynamics of inner struggle between the “new man” and the “old man” [Eph.4:22-24] etc. 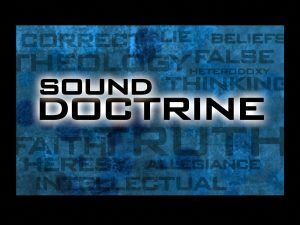 Sound doctrine is designed to produce sound Christians…believers who understand their identity, purpose, authority, and freedom “in Christ”. “Therefore my people are gone into captivity, because they have no knowledge…”(Isa.5:13). “And I, brethren, could not speak unto you as spiritual, but as unto carnal, even as babes in Christ. I have fed you with milk, and not with meat: for hitherto ye were not able to bear it, neither yet now are ye able. For ye are yet carnal: for whereas there is among you envying, and strife, and divisions, are ye not carnal, and walk as men?” (1 Cor 3:1-3). The above verses clearly portray two types of believers; those that are spiritual, and those who are carnal. Those who have assimilated and applied God’s word (sound doctrine) and those who have not. That is believers who have grown in the grace and knowledge of Christ and understand the purpose of being “in Christ” unlike those who have unfortunately remained babes in the Lord. Growth is the difference between division and harmony…sterile Christians and fruit-bearing Christians. It is quite natural for young believers to be carnal or fleshly. Spiritual maturity doesn’t happen overnight, it requires time and opportunity. The fledgling must, by faith, learn to resist the flesh and yield himself to a refining process, learning first hand, through a struggle with sin and self that, “the flesh profiteth nothing” (John 6:63). However, the nature of Paul’s admonition reveals that he felt the believers at Corinth should have grown by the time of his writing. Those at Corinth who were genuinely saved had sufficient time and opportunity to grow, yet they had failed to do so. For whatever reason, they hadn’t experienced normal spiritual growth and were still walking in the flesh. They hadn’t yet learned, or failed to apply, the basic doctrines necessary to “walk in newness of life” (Rom.6:4). So “then”, So “now” The tragic situation which occasioned Paul’s rebuke to the Church at Corinth is similar to the crisis we face today; only on a massive scale. There are many portions of Scripture that provide insight regarding world conditions in the end times. Second Timothy 3:1 for example, is a window into the latter days, depicting the total moral breakdown of a godless society, “…in the last days perilous times shall come”. But what about Christianity? What will the Church look like? I believe the third chapter of the Book of Revelation provides the answer. In verses 14-22, the word of God reveals the deplorable state of the Church of Laodicea, the last of the seven churches mentioned. The Laodicean Church depicts the widespread apostasy and spiritual famine of the latter days, a sobering snapshot of contemporary Christianity. Modern Christianity is a victim of liberalism/humanism and has drifted far from its Biblical roots, away from the fundamental doctrines which are vital to its effectiveness and well-being. Even among good Bible-believing churches, the divisive disparity of doctrine demonstrates the depth of deception in these last days. Day by day, as we draw closer to the return of the Lord, satanic influences are increasing, and contemporary Christianity moves further and further away from the fundamental truths of Scripture. In the book of 2 Thessalonians, Paul made it quite clear that the coming of Christ would not occur until certain conditions are met: “…a falling away first, and that man of sin be revealed, the son of perdition” (2 Thess.2:3). A falling away or mass apostasy, along with the revealing of the antichrist, will precede the “Day of Christ”. If we believe the word of God, then we should expect to see in these last days a progressive falling away from the pure word of God (K.J.B.) and sound doctrine to religion, philosophy, and compromise with the world. “For the time will come when they will not endure sound doctrine…” (2 Tim. 4:3). That which was prophesied regarding the decline of sound doctrine has indeed come to pass in our day and is, in many ways, responsible for the current spiritual famine. The crucial need of the hour is for leaders like the men of Issachar, “men that had understanding of the times, to know what Israel ought to do…” (1Chron. 12:32). Many of today’s pastors and Bible teachers are failing to adequately equip the saints to meet the extraordinary challenges of these perilous times. Much of today’s Bible teaching is shallow, lacking the necessary “spiritual understanding” to perfect and prepare the saints for battle; leaving God’s people unable to discern and resist the forces of darkness working in and through our depraved, secular society. For example, in our present self-centered culture, the doctrine of “self-denial” is a major stumbling block to spiritual growth. “Then said Jesus unto his disciples, If any man will come after me, let him deny himself, and take up his cross, and follow me” (Matt.16:24). A selfish life is precisely what prevents the believer from experiencing “newness of life.” Yet many contemporary Bible teachers fail to adequately, if at all, stress the extreme importance of this doctrine. Modern churches consider such teachings “hardboiled doctrine” impractical and unpalatable. As a result, multitudes of believers fail to, “grow in grace, and in the knowledge of our Lord and Saviour Jesus Christ”, remaining self-centered, worldly and unfruitful. The need to thoroughly instruct God’s people, concerning the life-changing doctrines of the Scriptures, is greater now than ever. The doctrines of the Bible are, “For the perfecting of the saints, for the work of the ministry, for the edifying of the body of Christ” (Eph. 4:12). Notice, the perfecting of the saints is a prerequisite for the work of the ministry. In order for believers to, “…be ready always to give an answer to every man that asketh” (1Peter 3:15) they must first be grounded in sound doctrine. The most effective tool of evangelism is a changed life; spiritually mature believers don’t need to be prompted to serve the Lord. For them evangelism is a way of life; the natural by-product of a close walk with the Lord. “That we henceforth be no more children, tossed to and fro, and carried about with every wind of doctrine, by the sleight of men, and cunning craftiness, whereby they lie in to deceive”. “Take heed unto thyself, and unto the doctrine; continue in them: for in doing this thou shalt both save thyself and them that hear thee” (1 Tim. 4:16). Paul obviously is not referring to Timothy’s salvation when he said, “save thyself and them that hear thee.” The context of this chapter deals with deception. So when Paul says “save thyself,” he’s speaking of being delivered from false doctrine. Save thyself and those whom you teach from being deceived. Sound doctrine is of utmost importance…especially, in the latter days. “Beloved, believe not every spirit, but try the spirits whether they are of God: because many false prophets are gone out into the world.” (1 John 4:1). The first step to being deceived is believing that you can’t be. Ignorance opens the door to deception by evil spirits, (2 Cor. 2:11). Consider the end time Church of Laodicea (Rev.3:17-18). God promised to preserve His word: “The words of the LORD are pure words: as silver tried in a furnace of earth, purified seven times. Thou shalt keep them, O LORD, thou shalt preserve them from this generation for ever.” (Ps.12:6-7, “Heaven and earth shall pass away, but my words shall not pass away.” (Matt.24:35 K.J.B) but not sound doctrine; He entrusted the Church (pastors, teachers, and elders) with that responsibility: ” Let the elders that rule well be counted worthy of double honour, especially they who labour in the word and doctrine.” (1 Tim.5:17).